Finding Art in History and Infamy A Review of "Situations: The installation at the Pinacoteca de São Paulo Collection"
Thirteen installations by thirteen artists invade the three exhibition rooms on the fourth floor of the Estação Pinacoteca through February 2017 at the collective show “Situações: a instalação no acervo da Pinacoteca de São Paulo” (Situations: The installation at the Pinacoteca de São Paulo Collection”). The works are either donations or loans to the Pinacoteca do Estado de São Paulo, the institution that manages Estação Pinacoteca, the sister museum founded in 2004, also neighboring the Estação da Luz railroad complex at the old center of São Paulo. Aiming public awareness on the conditions of the original inhabitants of the continent, “Yano-a” (2005), a collective work donated by artists photographer Claudia Andujar, Gisela Motta and Leandro Lima, depicts a burning oca (hut) of the Yanomami Indian nation in a video loop over laser-printed plastic sheet. 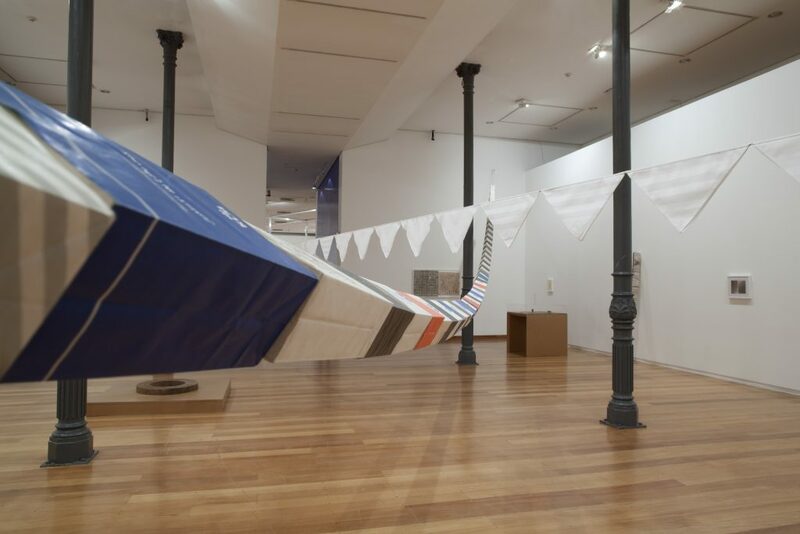 In the manner of motley hanging paper flags in a town fair, the airplane sickness bags of artist Jac Leirner’s “Corpus Delicti” (1993) evidence her body-of-crime works pinched in her whereabouts. 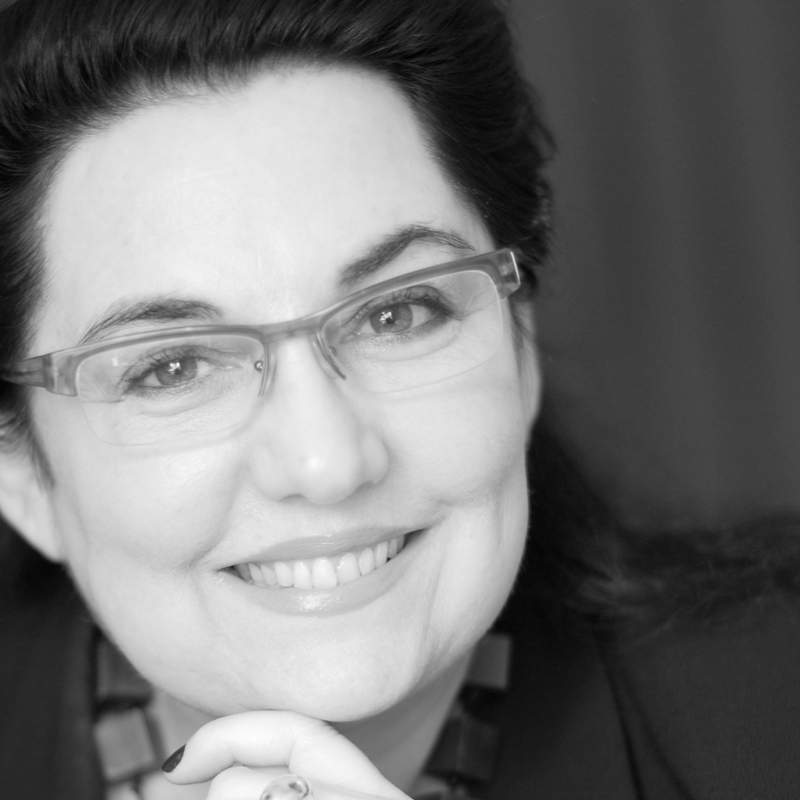 First exhibited in the same museum in 2011, it trails Jac’s obsessive collecting of commonplace consumer products. 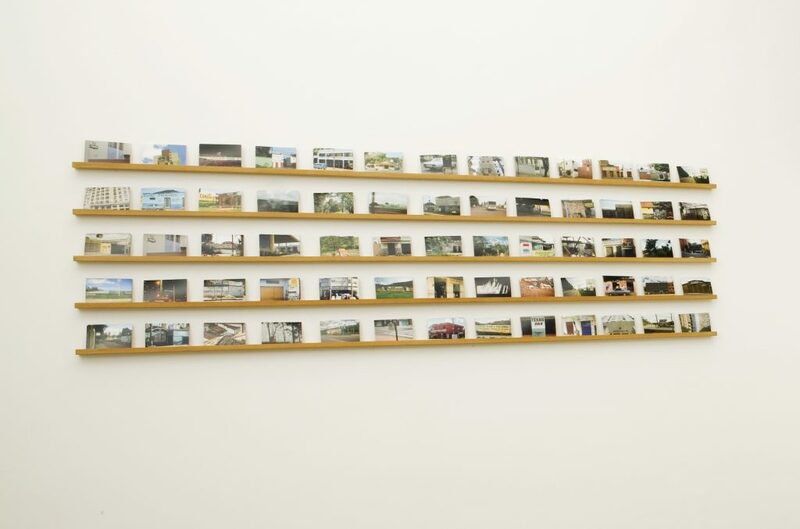 Following the likes of Wim Wender’s 1984 cult movie title “Paris, Texas,” the surrealistic slant of campy shop signboards ignites the investigative conceptualism of Rivane Neuenschwander’s 2007 series, “Mapa Mundi/BR.” Neatly displayed on wooden shelves, the artist’s photos printed as postcards for visitors to take away probe the at-times-nonsensical geography of shop-name design at small towns across Brazil. Standing out as historic piece in the eighties art scene and championing the concept of installation before it was cool, Guto Lacaz’s whimsical “Eletro Esfero Espaço” (Electro Sphere Space) was first exhibited in 1986 at “A Trama do Gosto,” a major collective exhibit at the Fundação Bienal, and the following year in the Museum of Modern Art of Paris. 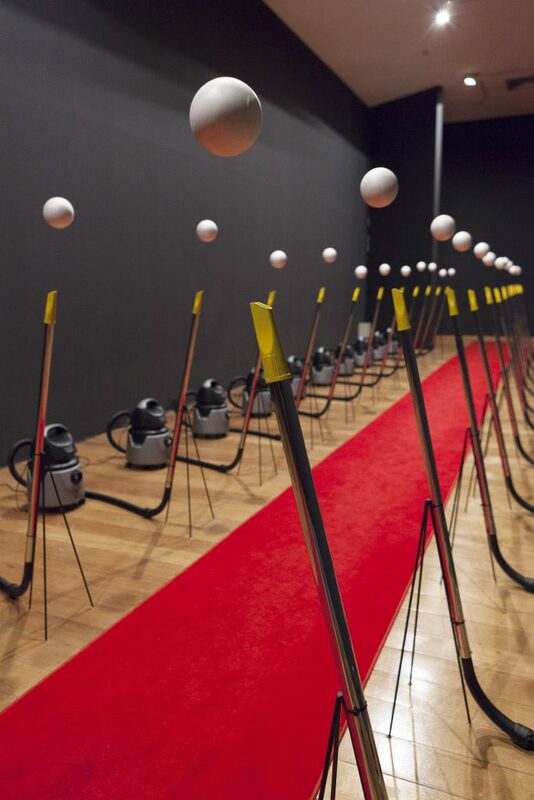 Occupying a seven-by-ten-meter all-black private area, the largest installation on show adds an Oscar-like edge to the banal by staging twenty-six identical vacuum cleaners turned on in two perfect rows. Like soldiers in rank with a red carpet rolled out, the household equipment formation invites visitors to catwalk while listening to an iPod looping Wagner’s Tannhäuser Overture. “In the eighties, it was played in a Walkman,” recalls Lacaz. But the knack of the gig goes a leg further: Each outward air stream playfully balances a pingpong ball. The second-largest installation puzzles the sense of perspective and makes a nod—in human scale—to traditional art class. The eighty-square-meter area with two-meter-high geometric shapes of “A Lição” (The Lesson, 2002) by internationally acclaimed Regina Silveira renders an homage to the sphere, the cube, the cone and the cylinder, the four shapes used since the early Renaissance to teach art students about three-dimensionality and learn about composition, form, perspective, light and shadow. 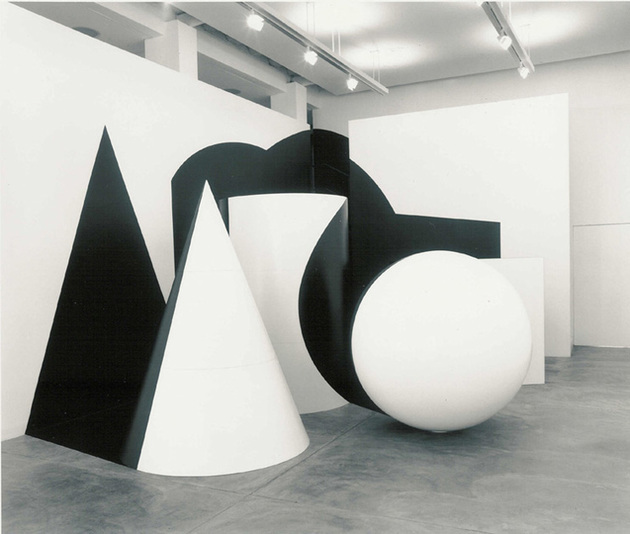 Enforcing a new reality with these elements makes for the core concept Silveira masterfully explores in her interventions with black-and-white paint or vinyl sheets over objects or buildings providing new meanings, volumes and perspectives to space. The most elegant and tricky sculpture on display, by Waltercio Caldas, is also a salute to art history via the circle. 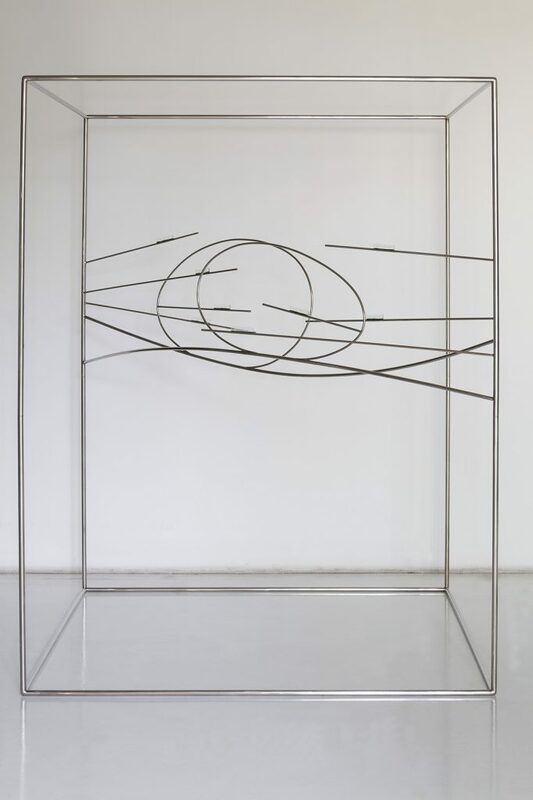 His “Rodin and Brancusi”(1997) is a light 203 x 151, 6 x 151, five-centimeter steel cube containing the diagram of two round shapes: a circle tagged Rodin and an ellipse tagged Brancusi. It acknowledges the research in sculptural volumes when art embraced modernity at the onset of the twentieth century. 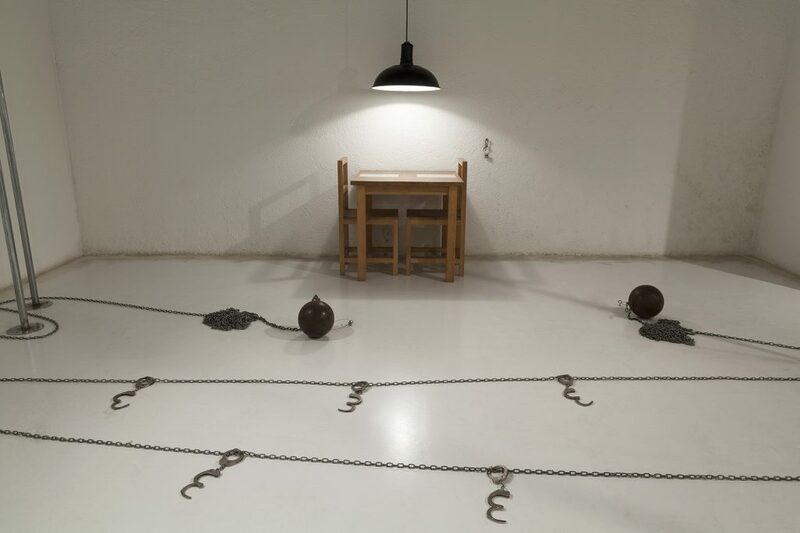 In the most political statement of all, at “Strictu II,” a 1999 installation by Cildo Meirelles, the visitor can be handcuffed and shackled to a steel chain with heavy iron balls in this depiction of mental and physical restraint. Under Brazil’s military dictatorship (1964-1983), the 1914 building that now houses Estação Pinacoteca witnessed the torture of millions who went against the regime since it headquartered the DEOPS/SP and prison cells of São Paulo’s feared political police. In 1980, then a labor-union leader, Brazil’s future president Lula was imprisoned here for thirty-one days. The exhibition also includes works of accomplished artists like Iran do Espírito Santo and Julio Plaza (1938-2003), as well as a new generation of Latin American talents represented by Brazilians Marcelo Moscheta and Mariana Manhães, and Argentineans Carla Zaccagnini and Nicolas Robbio.